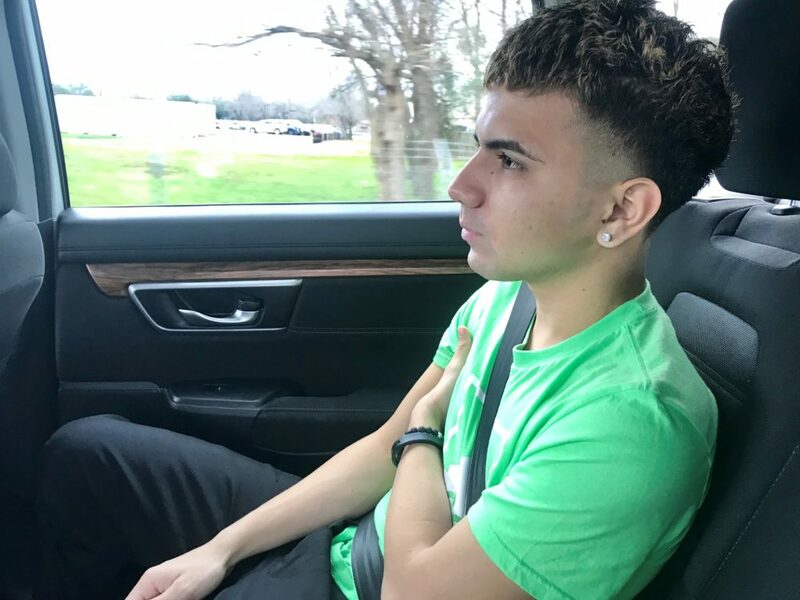 “I don’t know if the next time I go to court, I’m going to be deported,” said Dennis Rivera, a 20-year-old Honduran student whose controversial detention by ICE spurred protests in Houston last year. 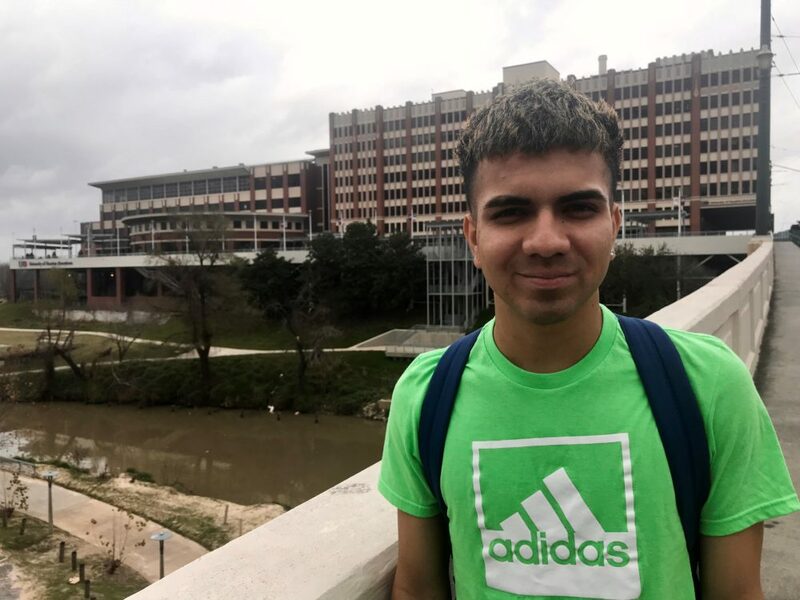 About a year ago, Dennis Rivera was in his final semester at Austin High School, just east of downtown Houston. He was a quiet senior who got good grades and was captain of the soccer team. Then one day, he lost his temper with a student who had been bullying him for being an immigrant. He pushed her down and ran. School police took him to jail and Rivera was arrested. Soon after, federal immigration agents showed up. “I spent about two months in a detention center,” said Rivera, who has since been released but faces an uncertain future. He’s in the process of pleading asylum in order to stay in the country. But, if he loses his case, Rivera will be deported back to his home country of Honduras. Schools traditionally have been supposed to be protected from immigration agents. But, as Rivera’s case shows, the Trump Administration’s aggressive push for tougher immigration law enforcement can easily cross onto campus. 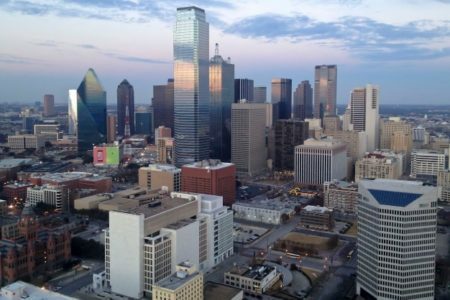 That push has heightened the fear of deportation for Houston’s half million undocumented immigrants, affecting the city’s health and safety. After he was arrested, Rivera spent nearly two months detained by Immigration and Customs Enforcement (ICE). The situation caught the attention of national media and prominent advocates of immigration rights. For now, Rivera, 20, is focusing the time he knows he has in the United States on continuing his education. He’s also gotten involved with an advocacy group, United We Dream, which he said has made him feel part of a community. After college, he hopes to become a math teacher, his favorite subject. “I had really good math teachers, especially when I was a freshman in high school,” said Rivera. He remembers mostly good things about his old school, he said. Sometimes he goes back to watch his former soccer team, the Mustangs, play. But, he said that he still questions how school officials handled the altercation, by going to police before getting a full account of what happened. According to him, the student who he had confronted at school never received any punishment. He also said that school officials didn’t seem interested in hearing his side of the story or looking into his record of good behavior. He said he never expected something like this would happen at school. Dennis Rivera rides a Lyft to his monthly meeting to check in with Harris County officials. 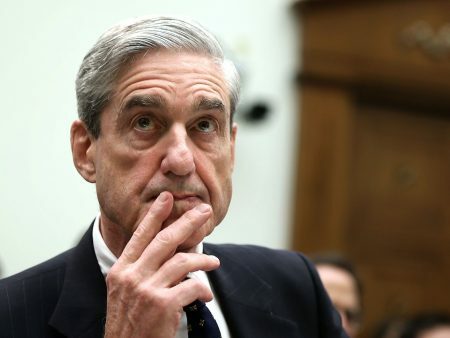 He’s required to go each month since his arrest in early 2018. How safe are schools from immigration agents? In 2017, a year before Rivera’s detention, the school board for the Houston Independent School District passed a resolution in support of immigrant students. “We will always have as our first priority the safety and security of our students and every student and every parent and every family should feel comfortable in Houston ISD that their children will be taken care of, they will be taught and more importantly, no one will ever ask their immigration status,” then Superintendent Richard Carranza told the board. But schools have limitations even if they are declared safe spaces. “Schools, for the most part, are considered safe harbors, as they say. These children have been given permission by the U.S. Supreme Court to attend school and they can’t be charged tuition and no school can make any kind of investigation into their immigration status,” said University of Houston Law Professor Michael Olivas, who specializes in immigration and education law. Olivas said that while schools are protected, there’s not much someone can do once ICE wants them. “You can hide out in a church and they may choose not to come get you because they have bigger fish to fry, but they know where you are and eventually they will catch up with you,” said Olivas. Rivera isn’t the only kid who has ended up in ICE custody because of an incident at school. One student in Long Island drew a mascot that a school officer interpreted as gang-related, which caused him to turn the kid over to ICE. The student was later deported, ProPublica and The New York Times reported. In Boston, a student was detained for 16 months after having an altercation at his school, according to reporting from WBUR. 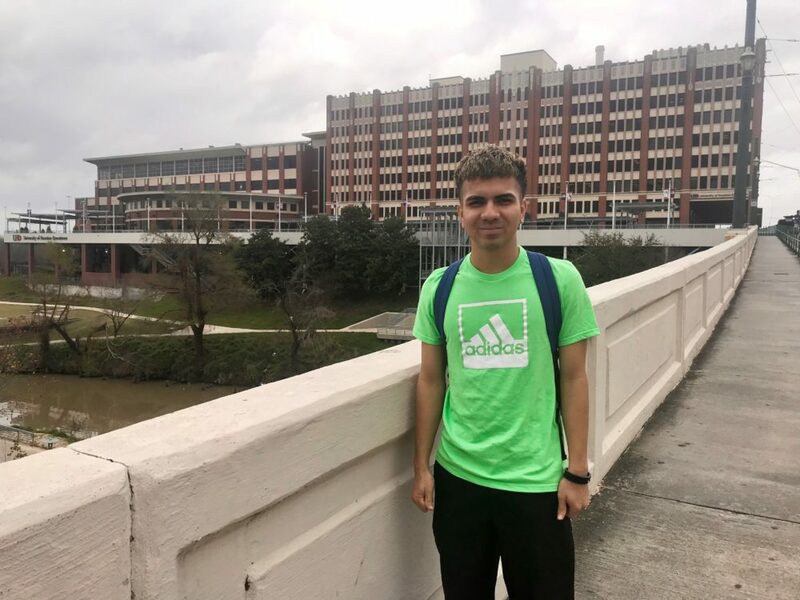 Dennis Rivera stands outside his school, University of Houston-Downtown. Rivera arrived in Houston six years ago. He fled Honduras with his family without much notice. For about a decade, Honduras has grappled with one of the highest murder rates in the world. He can’t say too much about their situation because it’s related to his asylum case. But he can say that his family’s lives were in danger and they had to leave quickly. “In a lot of people’s cases, like mine, you can’t just wait around because of the risk,” he said. 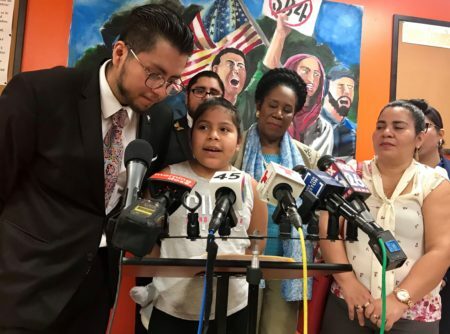 “Basically, I just had to leave from there and I couldn’t wait to do the formal steps (to immigrate) because I was putting my life at risk,” said Rivera. If he has to return to Honduras, Rivera said he still has family and friends there, but he would prefer to stay in Houston with his mom and brother if he can. “Sometimes I do get afraid of what is going to happen with my future. I don’t know if the next time I go to court, I’m going to be deported or I’m gonna stay here. I don’t know,” said Rivera. UPDATE: In response to the publication of this story, ICE provided a statement on their role in Rivera’s detention.